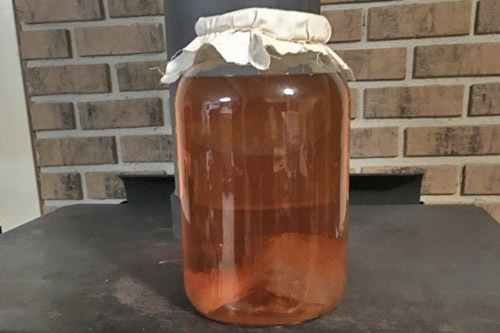 Anybody can learn how to make kombucha at home. Homemade kombucha is the best kombucha! The gist of it is: make sweet tea, add to kombucha culture, wait. You’ll need plain black tea or green tea, sugar and a pot to boil water in. A container to ferment in with a cloth to cover it and a rubber band to secure the cloth, bottles to store the kombucha, and a kombucha culture (called a SCOBY or mother). 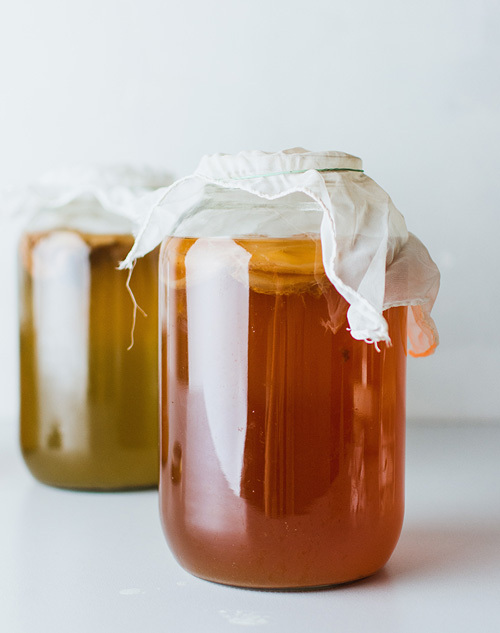 Ideally, you will have a small amount (a cup or less) of kombucha as well, either from your last batch or included with your mother if you didn’t grow it yourself, which you can use to help get this batch started fermenting more quickly and effectively. If you don’t already have a mother, you can buy one from Amazon or even find one in a Facebook group or Craigslist. The culture will play a significant role in the flavor of your finished kombucha so you may want to experiment with cultures from various sources and see what you like the best. Begin by brewing a gallon of sweet tea. I use about 1 cup of sugar for a gallon of tea, but the ratio is not critical – use your personal preference, as most of the sugar will be eaten and converted by the mother during the fermentation process. As for the tea itself, four tea bags or 2 tablespoons of black tea (or green tea) is a good amount, but this also is up to you. You will still end up with kombucha no matter how much sugar and tea you use, but the taste of your finished beverage will vary. Once your tea is brewed, remove the tea bags and let it cool to room temperature. When it is thoroughly cooled, you can add the SCOBY. It’s essential to ensure the liquid is not too hot when you add the SCOBY so that the heat does not damage it. Anywhere from 70-85 degrees, Fahrenheit is fine. The SCOBY may sink or float but it doesn’t matter, it will begin fermenting the tea regardless. Next is the hard part: waiting. It should take roughly a week to finish fermenting, but this, like pretty much every other aspect of brewing kombucha, is up to personal preference. The longer you allow the tea to ferment, the more acidic and less sweet the final product will be. Conversely, shorter fermentations leave more sugar unconverted and are less acidic. You want to find a happy medium. You can test your kombucha every few days to see how it tastes and decide when you’re satisfied with it. Avoid metal utensils when testing the kombucha, since metal can react with fermenting kombucha and create off-flavors among other problems. Use a clean glass utensil to check the taste. Once your kombucha is finished fermenting, bottle it. You can use a siphon or pour through a funnel, but make sure to leave around a cup of kombucha in the jar to use to get your next batch started. Use glass bottles only; some people recommend flip-top glass bottles like clear glass EZ Cap bottles available on Amazon. One thing to consider when bottling is that while the kombucha remains at room temperature, fermentation will still be occurring even if no culture is visible in the bottle and carbon dioxide gas is being produced. Avoid using plastic bottles because they can easily be damaged, and scratches in the plastic can harbor foreign bacteria. Plastic, even food-grade, may contain undesirable chemicals that can be harmful to the kombucha SCOBY. Because of the pressure, if glass bottles are kept at room temperature long enough, they could explode! You can avoid that danger by putting them in the fridge after a few days to dramatically slow fermentation, it won’t stop completely, and will resume once it warms up to room temperature again. Metal will react badly with kombucha so do not use it. Use plastic or glass utensils and a plastic funnel. Use ONLY clear glass bottles to store the final product. Sanitize your bottle with hot water or white vinegar. I ran mine through the dishwasher with no soap, just hot water. Before you remove your SCOBY, it is best to sanitize your hands with white vinegar. Do NOT use soap because it can kill your SCOBY. Kombucha is a delicious and healthy drink produced by fermenting sweet tea with a culture of yeast and bacteria. Once the sugar water has boiled for a few minutes, remove it from the heat and steep the tea in it. Wait for the tea to cool to room temperature, then remove the tea bags and put your tea in the fermentation jar or container. If you have leftover Kombucha, add it now. Cover the top of the container with cheesecloth or a paper towel and secure with a rubber band. Store the container in a warm and dry place out of direct sunlight. Most batches will take between 7 to 10 days to ferment but you can leave it longer to allow the SCOBY to ferment the tea even more. The longer you allow your kombucha to ferment, the more acidic and “vinegary” and less sweet it will taste, since the sugar is being eaten by the culture as part of fermentation. Just sample your brew every few days after a week or so to see how it’s doing, and when you’re satisfied with the taste, bottle it. Total Prep time is about 25 minutes. However, it takes anywhere between 7- 10 days to ferment, depending on your taste preference it could take even longer.